Osana family wellness is based in a beautiful villa in maadi, cairo. We offer yoga, pilates and other client-based barefoot classes, as well as all types of holistic treatments such as homeopathy, massage and reiki. pPregnancy and postnatal workshops, classes and support are available as well as baby, child and family classes. We also offer childcare whilst parents attend classes or treatments. All the services we have to offer are completed by a lovely wholefood cafe, wonderfully spacious garden, children’s play area, and boutique items for sale. Our vision is to build a friendly community hub where practitioners, individuals, parents, children, foodies and health enthusiasts can come together to meet each other through mind, body and play. Osana is looking for front office managers. Are you reliable and friendly, vibrant, organised and passionate about wellness? Want to work in a fun team? Please email Katherine ( mistressofpuppets@osanawellness.com ) to request a job description and tell her why you are right for the job! 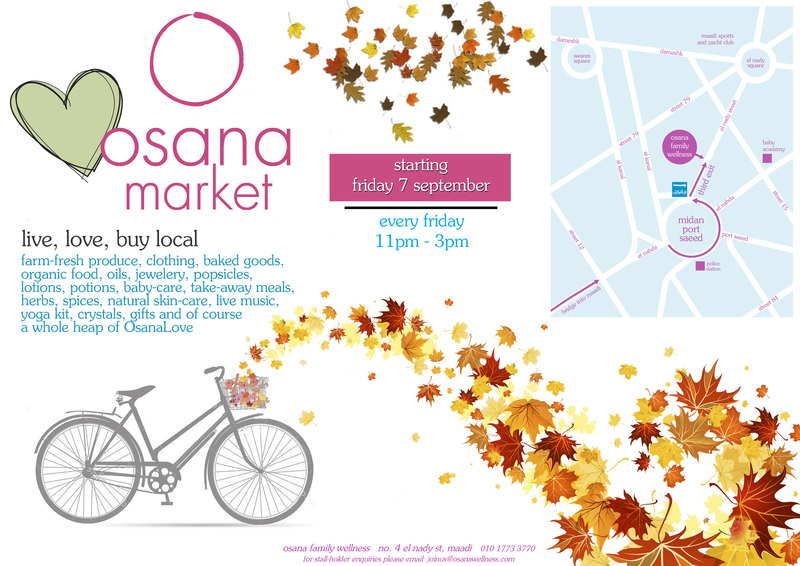 The Osana Friday Market has become a fixture in many of our clients diaries. We feature many wonderful vendors selling a vast array of locally produced items. Buy a 10 class yoga pass for only 1500le instead of 175le for individual classes. and sample all the different styles of yoga we have on offer at Osana. Practice twice a week and start to feel the benefits of yoga in all aspects of your life. Practice three times a week and experience the joy of the yogic lifestyle for yourself.